The Nineteenth Judicial District Commission on Judicial Performance unanimously recommends by a vote of 10-0 that Judge Michele Meyer BE RETAINED. Judge Meyer was appointed to the Weld County Court on September 19, 2007. 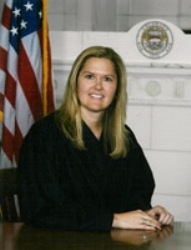 Judge Meyer obtained her law degree from the University of Denver and has an undergraduate degree from Colorado State University. She was employed by the Weld County District Attorney’s Office from November 1999 until September 2007, ascending to the position of Chief Deputy District Attorney. Judge Meyer is involved with the mentor program at the University of Northern Colorado and spends considerable time with the Weld/Larimer County High School Mock Trial Competition. Judge Meyer attends legal education (CLE) classes outside of the annual judicial conference she attends. She is involved in the “Judicially Speaking” program which helps educate high school students about the legal process. The Commission conducted a personal interview with Judge Meyer, reviewed opinions she authored, observed her in court, and reviewed surveys completed by attorneys and non-attorneys. Among the survey questions was “how strongly do you recommend that Judge Meyer be retained or not retained?” Of the attorneys responding to the survey, 76% recommended to retain, 7% recommended not to retain, and 17% made no recommendation. Of the non-attorneys responding to the survey, 90% recommended to retain, 4% recommended not to retain, and 6% made no recommendation.